DLS ~ Radiance MESH Eyes – Pre-release! | .:Soul:. DLS ~ Radiance MESH Eyes – Pre-release! 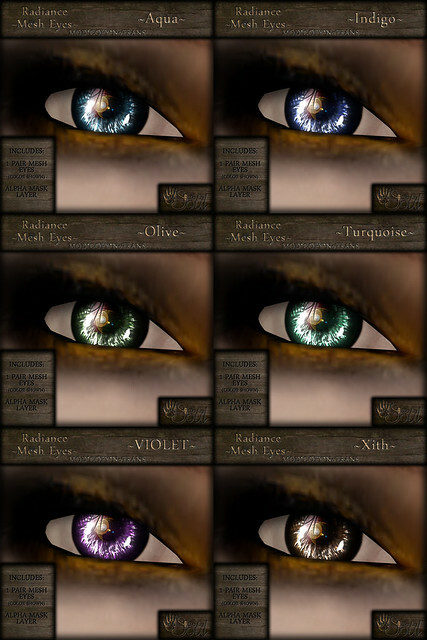 For 25L Tuesday I have released six pairs (colors) of the new Radiance MESH Eyes I have been working on! Why MESH Eyes? Why not Prim Eyes? Because Mesh eyes have a clearer image mapping on them. Meaning your eyes will be crystal clear, instead of looking somewhat blurred as on prim eyes, or as a default avatar eye does. That is only one of the reasons to go mesh with your eyes. Okay… so why YOUR mesh eyes? What makes them so special? That is the best part of all. Where on most mesh and normal prim eyes, if you make the texture glow, or full bright, tint it, or use any kind of bumpiness (Check your texture tab in the edit window for these), the WHOLE eye is affected. This leads to unpleasantness. With the DLS Mesh Radiance Eyes, I have solved this problem… to a point. On the eye are two texture spots. One for the Iris and pupil, and one for the white of the eye. This means you can go into “select face” and select just the irises, and tint, glow, well, basically do whatever your little heart desires to change how the eye looks. OMG I WANT! Where do I get them? Just follow the green signs, or head over to the building with the orange interior. I can’t see the eyes, they are just a box or cylinder. This is because you do not have a MESH enabled viewer. I would suggest you update to Viewer 3, or the newest version of Firestorm. If you DO have a MESH enabled viewer and cannot see the eyes, wear the ALPHA layer that is included. The eyes are NOT rigged, so you can stretch, shrink, and resize to fit your avatar perfectly. This entry was posted in New Releases and tagged beauty, clothing, gaming, style. Bookmark the permalink. ← DLS- LoliDeo, Glaive, & The Gypsy!